Unfortunately there is no perfect formula for tough conversations. But while having them can be hard, NOT having them tends to be far more painful in the long run. 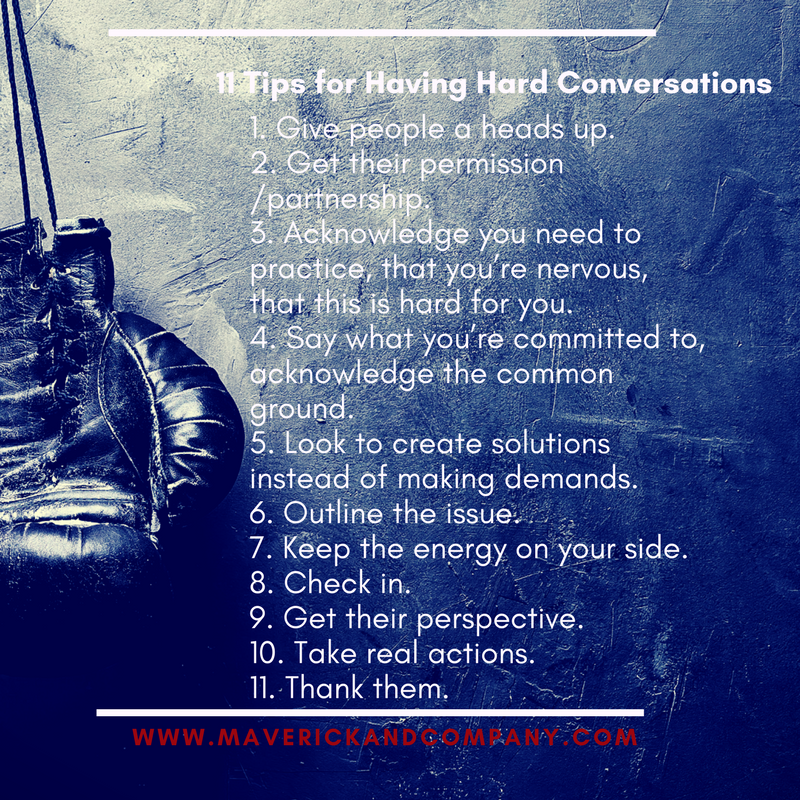 If you need to have a hard conversation, here are 11 tips for how to have a better one. 1. Give people a heads up. “I’d like to talk with you about something. Is now a good time or …?” Don’t ambush people. Give them a heads up so they can mentally/emotionally prepare. 3. Acknowledge that you need to practice, that you’re nervous, that this is hard for you. Whatever is true for you, just acknowledge it. That way you take away some of the pressure to do it perfectly. You give yourself (and them) some space and freedom. 4. Say what you’re committed to/acknowledge the common ground. This is critical because people may not agree with your perspective but generally your commitment to “have a relationship that works for both of us,” or “give customers the best service we can,” or “to support you in being a great manager for your team,” is tough to argue with. This creates common ground and gets you both focused on the big picture. 5. Look to CREATE solutions instead of making demands. Especially with people who are at your level or above you, make sure you don’t make demands or try to force a particular outcome. Your goal is to make them aware and partner with them in finding good solutions, generating clarity, creating something positive out of the conversation. 6. Outline the issue…keep your comments as neutral and as short as possible. “There are times in meetings when I feel like you and I get our wires crossed." 7. Keep the energy on your side. This may sound a bit silly, but watch how you use your words and energy. If you keep your energy to yourself and don’t throw it at the other person, you’re far less likely to get a defensive reaction. Don’t throw arrows with your words or tone or gestures or eyes. Contain your emotion and energy. 8. Check in. Questions like, “Does this sound reasonable?” or “Make sense?” or “Is this something you’ve been thinking about or a total surprise?” give the other person a chance to give you some feedback about where they are. They may jump right into the details or buy themselves some time to process by focusing on their reaction to the general topic. You’re creating dialogue opportunities…which is critical to a successful exchange. 9. Get their perspective. You want to be genuinely curious about how this issue looks from their side. Realize they may need to vent. Give them plenty of space to say what’s true for them. If they pause or stop, wait until they acknowledge that they’re done or 30 seconds go by. People often have more to say and it’s important that they get to be really heard. 10. Put a bow on it/take real actions. Conversations like these need to have a resolution. In the moment you might agree on a new behavior. Someone might make an apology. You might create a new plan. OR you might simply set a date to circle back and discuss further. You might agree to check in with them in a few days for suggested resolutions. What you do NOT want to do is to have a tough conversation and not get to a resolution. 11. Thank them. You can always appreciate someone for being willing to talk with you, for their commitment, for their efforts, for their generosity…maybe all of the above. And you should. It helps you remember they are your partner and helps them feel like you are theirs. IF things become heated or too intense, consider calling a time out to give both people time to calm and regroup. You might also consider asking a third person to facilitate or support you and the other person. A third party can help diffuse tension and smooth over difficulties. In the end, no matter how tough it is to talk to the other person, it’s far, far better to have the hard conversation than to keep having the problem. Good systems and processes make it easier for people to get good work done. You may need better reporting, not better communication. Learn how to spot gaps in your infrastructure with this article. Leadership is a tricky thing. Sometimes being too good at everything means you don't build the systems you need to get things done without you. Are you a Personality Leader? Find out HERE.